If one word might describe Tehachapi businessman Mano Lujan, it's probably the word that he would use to describe the kind of food he wants to serve in his restaurants. Authentic, as in fresh and real. It's the kind of food he began cooking at street fairs in Tehachapi, straightforward and delicious. The kind of food that keeps them coming back to his Red House BBQ restaurant, opened in July 2010 on East Tehachapi Boulevard. The same authentic, freshly-prepared, fabulous food that is likely to cause a traffic jam when his new drive-through restaurant, Red House Express, opens soon in the caboose on West Tehachapi Boulevard most recently known as The Whistle Stop. And the kind of food that he believes will inspire a revitalization of one of Tehachapi's landmark restaurants, formerly known as The Apple Shed. The restaurant, located along the railroad tracks in a building operated by former Tehachapi Mayor and civic leader Jake Jacobsen and his brother Rolf, as a seed-packing shed, is now under Lujan's management. The building served as an apple shed owned by Nunes Farms and in 1996, Jacobsen's niece Anne Marie Novinger and her husband, George, opened a restaurant there with partner Shirley Fuller and her son, Mike Fuller. The Apple Shed quickly became a favorite of locals and tourists alike. In 2005 the restaurant was sold to Mary Lou Vachon (now Zamudio), who operated the business with her husband, Jacques. The Novingers resumed ownership on Nov. 7, 2013, and hired Lujan as general manager, tasking him with bringing his own high energy brand to what is now known as Tehachapi's Original Apple Shed. Word that Lujan is bringing a new vision to a favorite location may account for the upsurge in traffic at the Apple Shed over the holidays. Mano and his wife, MeiMei, along with George and Anne Marie, have been busy greeting the crowd while also putting in a new menu and installing a salad bar and soup bar (and there's word that a pasta bar is in the works). Red House BBQ always takes a break over the holidays, allowing employees to have some time off with their families and the owners a chance to get some work done on the building (this year that included repainting the floor), Lujan said. Still, catering jobs kept them hopping, and the number of cars surrounding the Apple Shed seemed to grow each day. "Word must be getting out," Anne Marie Novinger said, as she watched Lujan work the dining room of the Apple Shed on a recent Saturday morning. He worked non-stop, chatting with customers and checking on the ingredients of the salad bar. The popular restauranteur admitted that some patrons have been wary of a new menu, wanting to make sure that their favorites would still be offered. Some will, some won't he said -- what he wants to be sure of is that customers can count on freshly made items, never canned or frozen. Breakfast includes thick-cut bacon and country-fried potatoes. Homemade soup and fresh veggies for make-it-yourself salads are offered for lunch. Fresh-squeezed orange juice is in the plan. And the dinner menu is being re-worked, too. "Think simplified," he said with a smile. The gift shop will be restocked soon, with only made-in-Tehachapi merchandise, said Anne Marie. While working in the hazmat waste business, Mano traveled the world and heard warnings about not eating the street food; while co-workers headed for the closest McDonald's, he would head down the darkest alleys, following his nose to find incredible food, sometimes being cooked over fire in a steel trash can. "I ate a lot of bad food, too," he said, "but more often found just delightful meals prepared by people who took a lot of pride in what they did, sometimes using recipes that had been handed down for generations." Food was an important part of growing up for the youngest of three boys raised by a Marine father and a Hawaiian-born mother. "We were poor," he said. "Eating out was a rare luxury. So we cooked." Born at the Marine base in Barstow, he grew up mostly in Southern California where he played football at Azusa High School -- and baked. "I went through a baking phase in high school," he said. "Which is funny because I don't bake now. But I would make brownies and give them to friends. Cheerleaders thought it was funny, the football player bringing them brownies." His father was a hunter, so the family diet included plenty of barbecued meat including venison. He learned to barbecue, too. Still, he didn't think of making food a career. Instead, he studied environmental science and ended up working in hazardous materials waste management. His passion for food grew, though, as he traveled and he particularly enjoyed Japanese food, eventually going to culinary school. "People think of Japanese food as sushi," he said, "but there is so much more. Thinking of Japanese food as sushi is like thinking of Italian food as pizza." When he was attending cooking school, his teacher asked the students to share their motivation. Most said they wanted to be chefs or own restaurants. Mano said he loved Japanese food and wanted to learn to make it for himself. Later, he thought he might want to put his culinary education to work, but could not find work in Japanese restaurants. "I think they just couldn't see this six-foot-five Indian guy cooking in a Japanese restaurant," he said. By Indian, he means Native American, and coincidentally Indian frybread, which has been a staple food in many Indian households for more than 120 years, helped inspire the next stage of his culinary career. Frybread is literally a fried bread made of flour, sugar, salt and lard. Frybread resembles a Mexican tortilla but is thicker, almost puffy. It is believed to have been developed by the Navajo in the 1860s using ingredients given to them by the government when they were forcibly moved from their homelands. "Indian Tacos" are made using frybread and commonly served at powwows and similar gatherings. As an Indian, Mano grew up eating frybread and after moving to Tehachapi eight years ago, attended a powwow where he excitedly introduced the food to his wife, MeiMei. Unfortunately, he said, it was terrible frybread and he was embarrassed to have shared it with her. That experience rekindled his interest in the comfort foods of his childhood. Soon thereafter, he found a rusty old portable barbecue for sale on eBay for $800, and convinced MeiMei that they could make money traveling to powwows to sell frybread and barbecue. He lost a lot of money before he figured out the traveling food business, Mano said. But he kept at it and eventually was ready to sell food at Tehachapi's big annual event, the Mountain Festival. Unable to secure booth space, he was disappointed. But local businesswoman Mel White came to his rescue, allowing him to set up to sell barbecue next to the art center she operated at the time along Mojave Street near downtown. "She might not know this, but she saved me," he said. "I owe her a lot for that opportunity." He also credits restaurant owners Barbara Ferrante (Jake's and On the Blvd.) and Cathie Sibley (La Bella Amore) for their assistance when he was getting his culinary act together in Tehachapi. Mano and MeiMei moved to Tehachapi after the birth of their daughter, Layla, now 9. Soon thereafter he spotted the building at the corner of Hayes Street and Tehachapi Boulevard and told his wife that was where he wanted his restaurant to be. He didn't know at the time, but others had a vision for that space, too, and Mama Hillybeans opened up at that location. Time passed, Layla was joined by a brother (Milo, now 7), and Mano kept cooking. MeiMei encouraged him to try out for the Fox cooking show, Hell's Kitchen and he did. After several rounds of interviews -- and practice in the kitchen at Jake's Steakhouse -- it seemed likely he would make the show. But that was not to be. "I was a bit of a brawler when I was young," Mano said. "and I couldn't pass the background for the show. But as it turns out, Mama Hillybeans ended up closing and I was ready for the opportunity. If I had made it to Hell's Kitchen I likely would have missed out on opening Red House BBQ." Opened in early July 2010, Red House BBQ has been what can only be called a phenomenol success. 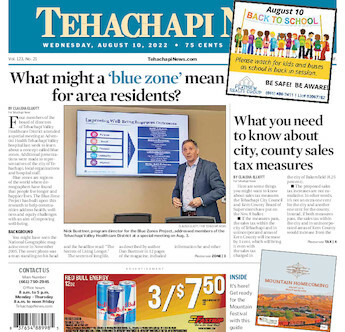 But Mano admits that not all of Tehachapi has been able to embrace the way he does business. "If we're out of food, we close," he said. "If it's not fresh, we don't serve it. We don't have canned goods or food to pull out of the freezer." Through the years, though, he's increased the amount of food that can be prepared at Red House. "We started with a smoker that could handle 500 pounds," he said. "Six months later we added capacity for an additional 150, then another 300. Now we have a big work horse that can cook 750 pounds at once. We can feed 3,000 people a day now." Some of that food will find its way to serving at Red House Express when it opens. And Mano and MeiMei are still working on plans to open Red House BBQ in China, a project he estimates will take several more years to bring to fruition. He said his enthusiasm for working with the Novingers to keep the Apple Shed open pays homage to the icon that the restaurant has been -- just across the street and down a bit from Red House BBQ, both sure to keep Tehachapi residents and visitors satisfied with tradition and authentic, good food.